I’ve been listening to 1964EARS’ custom IEMs since December of 2010 when I received my 1964-T, a triple-driver monitor from the company’s first-generation lineup. Since then, I’ve had a chance to also try the mid-range 1964-V3 model and the higher-end V6-Stage. In both cases I was impressed by the performance and especially value for money when comparing them to similarly-priced sets from other brands, foreign and domestic. Now, 1964 is finishing up work on a new flagship – the A12. The A12 is notable not only for being the most advanced (and pricy) product in 1964EARS’ history, but also for utilizing a technology developed by Asius Technologies known as ADEL (which stands for Ambrose Diaphonic Ear Lens, after its inventor and Asius CEO, Stephen Ambrose). The main idea behind ADEL is that the operating principle of in-ear monitors – having the earpieces sealed inside the ear canal, creating a closed system with driver and ear drum – is unnatural as far as sound reproduction goes when compared to live sound, speakers, and even unsealed headphones, and can even be potentially damaging to the ear in the long run. 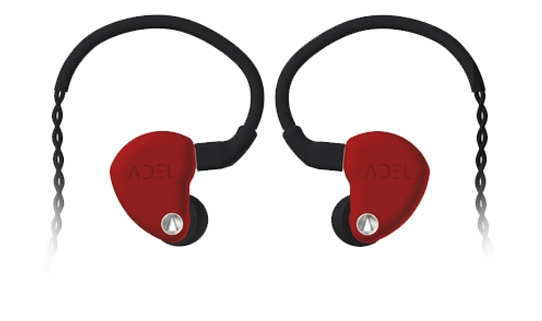 I first read about ADEL and the potential issue of over-pressurization of the ear drum when using in-ear monitors back in 2011, when the original ADEL concept was unveiled. I don’t remember which article it was that I read – probably this one from Sound & Vision – but the “inflatable balloon” concept left an impression. I thought the idea interesting but likely impractical as far as the inflatable balloon goes, and put it out of mind until 1964EARS launched a Kickstarter campaign for a new earphone lineup developed in collaboration with Stephen and Asius Technologies earlier this year. This meant that the latest crop of 1964EARS monitors would be using a variant of the ADEL technology. In its current iteration the desired effect of reducing or eliminating the unnatural pressures inside the ear is achieved with a membrane placed inside the earphones (in its own separate sound tube) that acts as a “second eardrum” and is meant to absorb pressures that would otherwise be pushed against both the user’s eardrum and the driver of the earphone – neither of which is a good thing for audio fidelity, according to the creators. The membrane is adjustable and can be made tighter and looser, as needed, and can also be bypassed (or rather disabled) completely by sealing the chamber behind it, which prevents membrane excursion. All this is done with a rotating knob located somewhere on the earpiece. Those interested in the current implementation of the ADEL technology can read more about it on the above Kickstarter page – as usual, I am interested primarily in the sound of the earphones. The A12 beta unit I received was a last-minute arrangement – I had glanced over the aforementioned Kickstarter when it first launched and even shared it on The Headphone List’s Facebook page, but certainly didn’t expect to be able to try it until Vitaliy from 1964EARS got in touch and asked if I wanted to give the A12 a listen. Fast forward a week and a half and I had a set of beta A12s in hand and ear. First the basics – aside from a watch-style rotary knob at the bottom end of the faceplate, the A12 looks and fits like any other of the half-dozen or so clear acrylic custom IEMs in my collection. It utilizes a standard 2-pin detachable cable. The ADEL module of the A12 is removable – it can be extracted quite easily by pulling on the knob. It is small – less than 5mm in diameter and about 8mm long with the knob. Removing it leaves a gaping hole in the housings and doesn’t do the sound any favors, completely dropping out the low end as expected with an unsealed balanced armature IEM. As mentioned above, the unit I have here is a beta test sample. From what I understand, the configuration of the A12 earphone itself is final whereas the ADEL modules might still undergo some revision. The purpose of this post is not to verify the science behind the technology – I have neither the background nor a particularly strong interest in doing that. As usual, I will leave discussing the science and tech to those more well-versed than I. All I care about is the end result – i.e. the sound – so what I wanted to do was compare the A12 with the ADEL technology to a couple of the other high-end custom IEMs in my possession. The source used in my listening is primarily an OPPO HA-1, a full-size DAC/amp with surprisingly low output impedance at the headphone jack. First a general note on the sound – the A12 can be characterized as a smooth and neutral earphone with a very slight perceived warm tilt. I actually found it to be spot-on neutral for my own preference, falling in the midst of all of my other “neutral” in-ears. Coincidentally, taking out the ADEL modules and sealing the holes where they used to be increases bass quantity, but also introduces some bass “boom”. I can see a sealed A12 appealing to some people and it will go toe-to-toe with some of the warmer custom IEMs out there, such as the Westone ES50 and Heir Audio 8.A. The general sound performance of the A12 has a couple of notable strengths, the first being balance across the spectrum and a very natural tonal character all around. Another is smoothness – I’m not among those who are greatly bothered by mild treble unevenness, but it’s something I do notice. The A12 has none that I’ve heard so far, easily beating my 1964 V3 and V6-Stage in that regard. The final one is the presentation, which is nice and airy – more so than any of the sets I’ve managed to round up for comparisons so far. To start off, I pitted the A12 against a high-end universal in-ear monitor. I selected the InEar StageDiver SD-2, which I consider to be a straight-shot upgrade from some very popular mid-range in-ears and an excellent-sounding product for the price. The SD-2 has a very smooth sound signature slightly on the warm/dark side of neutral, with excellent end-to-end extension. The bass of the SD-2 is rather flat, but compared to the A12 there is a boomy character, almost like a resonance, that’s audible at the low end. The A12 sounds cleaner and tighter, and more natural as a result. Likewise, in the midrange the A12 has fantastic clarity that the SD-2 trails. The A12 is not a bright earphone, but the slightly dark tonality of the SD-2 is also very apparent in comparison. The biggest difference, however, was in the way the sonic space is presented. The SD-2 is a very competent earphone, but with its darker sound and slightly boomier bass, it can’t hold a candle to the open presentation of the A12. The soundstage is smaller all around and appears enclosed – even congested – in comparison. On the whole, the A12 sounds more spacious, more refined, and somehow more “delicate” – a very potent combination. The V6-Stage is probably my favorite monitor in its price range – it didn’t replace the more expensive JH13 Pro as my CIEM reference, but in everyday listening I quite like its slightly v-shaped sound and well-extended bass. The biggest complaint with the V6-Stage for me has always been treble smoothness – the peak (or two) present at the top end are more noticeable with some records than others, and on occasion can point out sibilance in a rather aggressive way. No such danger with the A12 – the top end there is smoother and significantly more refined, making the highs of the V6-Stage sound a little shimmery, almost metallic in comparison. The A12 also sounds more full-bodied, and yet at the same time clearer than the leaner V6-Stage. The V6-Stage does dig a little deeper in terms of bass and occasionally derives some additional perceived clarity from its brighter, sharper highs, but in the sense of being more transparent and less congested-sounding, the A12 still wins out. Noble’s quad-driver, silicone-shelled 4S is also a rather balanced and neutral-sounding in-ear, but its signature leans in the opposite direction from the slightly v-shaped V6-Stage and JH13 Pro. The 4S is more mid-centric, with slight bass roll-off and relaxed, almost smoothed-over treble. Next to the A12, its bass sounds a little gutless and lacking in depth – pretty much the opposite of the V6-Stage. The A12 appears more dynamic, and its low end has better definition. The 4S is a little more vague and not as clear overall despite sounding a bit leaner. The A12 sounds more rich without being in the least bit “bassy” in the conventional sense. The A12 is also a little more crisp and focused in the treble region where the 4S tends to be more smoothed-over, and sounds more natural as a result. Unlike the majority of audio and consumer electronics products, the UM Miracle has appreciated in price over the years – an odd development considering how much more competition there is today than in 2010 when it was first introduced. Next to the 1964 ADEL A12, the Miracle is lacking mostly in clarity and openness. Its midrange sounds more distant and somewhat muffled compared to the more prominent mids of the A12. Treble quantity is similar between the two but the Miracle is just a bit less smooth. The A12 is also clearer, and this clarity also seems to carry over to the presentation, where the A12 is a bit more spacious, but more importantly has better imaging with more distance/separation between instruments. The JH13 has been one of my IEM benchmarks since first listen. Several of the custom IEMs I’ve heard since have given the JH13 a run for the money in this way or that, but I think the A12 does the most convincing and complete job of it. The JH13 follows a balanced, slightly v-shaped sound sig with some bass emphasis and strong treble. Thanks to the slight bass hump, its low end is more powerful than that of the A12, and a bit more boomy as well. The bass of the A12 still has good impact, but better quality. The A12 sounds a touch clearer on occasion and has a more full-bodied, less “analytical” sound than the JH13. It’s smoother and more natural than the JH13 up top, too, making the JH Audio set sounds a little harsh/edgy in comparison. The A12 even has a slightly more 3-dimensional and spacious sound presentation compared to the more forward and aggressive JH Audio unit. The Harmony 8 Pro from Poland-based Custom Art is a silicone-shelled, 8-driver CIEM that I’ve been using quite a lot lately. To me it sounds like a slightly brighter V6-Stage with slightly less bass and a bit more clarity, which makes for a solid reference earphone when it comes to listening for fine detail. It is thinner than the A12, and of course is tonally brighter and more “analytical” in presentation. Clarity is about on-par but the warmer, more full-bodied A12 sounds smoother, more natural, and more spacious, and even carries a bit more impact in the bass than the H8P. The NT 6 from Korea-based Hidition is a bright, hyper-detailed 4-way earphone on the performance level of the JH13 and Harmony 8 Pro. Clarity is similar between the ADEL A12 and the Hidition unit, but the NT 6 derives some of its clarity from its brightness. It’s actually quite impressive that the A12 can keep up in clarity considering its warmer and more full-bodied sound. The NT 6 has a cooler tonal character and its treble sounds more splashy/not as smooth. The A12 is also a bit more spacious with better soundstage depth and layering. I recently picked up a new reference in full-size headphones, finally retiring my trusty Sennheiser HD600, and now I feel that the 1964 ADEL A12 may be able to do the same to my favorite in-ear monitors. The price puts it in a class of its own compared to my other CIEMs, but in my listening thus far its has the fewest concessions of any top-tier CIEM I’ve tried. Balanced with a very mild warm tilt, it can be described as refined and extremely “comfortable”-sounding, remaining smooth, natural, and un-congested even at louder volumes. More time will need to be spent to see if I’m getting the best possible performance out of the A12, but it is deserving of a full review down the line. Even ignoring the stated potential benefits of the less-than-fully-sealed IEM design to long-term ear health, reduction in listening fatigue, etc. (some of them potentially more important to stage musicians than audiophiles), the A12 is shaping up to be a great earphone. NT6 and K10 are similar but I thought K10 sounds better. Is A12 close to NT6? I thought the A12 sounded better than the NT6 – more full-bodied and not as bright, yet equally clear and with smoother treble and a marginally more spacious presentation. Did you like k10 or a12 better? And what kind of genre do you listen to? I don’t have a K10, sorry. And I listen to a pretty wide variety of stuff, but leaning towards Rock/Metal and subgenres. when you will reveiw Roxanne ? I couldn’t find ciem best it in terms huge space and soundstage . I was wondering if you have gotten your CIEMS back and had a chance to do further listening and if you have had a chance to demo the new fixed (self adjustable) module vs the adjustable module you were provided. Thanks! No, not yet. I’ve been a little busy with other reviews and haven’t had a chance to follow up with 1964 about getting new modules. I should do that now that they’re close to being released. Do you have any idea about an official release date for these yet? I’ve read somewhere that they are coming out officially this month but I’ve also read somewhere else that November is the month of release. Also, can you confirm for me how the adjustable module works? Is the extra ‘eardrum’ activated when the module is in or out? Or is the extra ‘eardrum’ always activated? I am not sure when these will be released. From what I understand, the knob changes the tautness of the membrane from “very tight”, which essentially acts like a solid wall and not a membrane at all, to “very loose”, which almost acts like an open-air boundary. I guess every state between those two extremes can be considered “activated”. If you pull out the ADEL module entirely, you just get an open hole, so you can make them fully open if you wish. Would love to hear your thoughts on A12 compared to Legend-R. Thanks! Hopefully I’ll get a chance to try the Legend R later this spring. 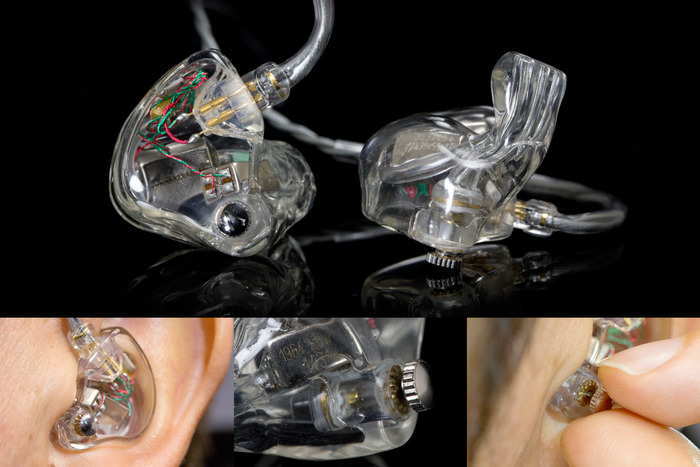 Do Westone E60’s come close? Not sure. The only custom-fit model I have from Westone is the ES5 (reportedly identical in tuning to the ES50) and it doesn’t. But the ES60 could – not sure. I really love your reviews, it really is an eye opener. My question is how does the ADEL A12 CIEM compare with LCM BD4.2 CIEM in sound quality? can you share your thoughts about the comparison between TG334 and the A12? I compared them briefly further down the page: https://theheadphonelist.com/brief-review-1964ears-1964-adel-a12/#comment-50815 . Aside from having very good mids they are not really competitors – the TG334 is fairly bassy and a little dark while the A12 is neutral and monitor-like. Something like the Heir Audio 8.A would be a better custom-fit match for the TG334 sound sig. How game changing are the A12s? I currently use the ER4S as my go to IEM and I am starting to look for an upgrade. I have narrowed it down to the K10 or the EarWerkz Legend R. I just found out about your review on these and would like to know your opinion. Should I wait for the A12s or should I grab either one of the customs mentioned before? Thanks. Unfortunately I can’t offer any thoughts on the K10 or Legend R.
Or how you have found using the Adel dial, where your sweet-spot is how much the sound signature/quality changes with the opening and closing of the valve? To be honest I haven’t really used them since except as a benchmark for some lower-end CIEMs that I’m testing out. I also sent my modules in to be repaired/updated. From what I could tell, the ADEL dial does not yield immediate results in sound so it’s quite hard to “dial in”, especially because there are no stops/notches on it and the left and right rotate in opposite directions (on the beta units – this will be modified later as far as I know). Any differences with turning the dials in the short term are subtle – you definitely still know you’re listening to the A12. It’s not like you go from muddy and bloated sound to something refined and Hi-Fi. It’s really only with long-term listening and A:B comparisons that you start noticing the level of performance. I got a chance to listen to the A12 with the self adjusting Adel module. Have they sent you one yet? I must say I GREATLY prefer the A12 soundstage to the V8 or V6s, it was much larger like the 8.A but more natural still! I attribute that experience to Adel, and the lack of pneumatic pressure and lack off too much resonance with those “bass” frequencies…. The bass and soundstage made it sound great and it really had a lot of sweetness… I admit going back and forth the 8.A still made me smile, but the A12 had that quality as well, the soundstage was as big maybe bigger but more natural. My wife felt it was larger and more enveloping around her. This was all with the self adjusting module which from what I recall being told means that the bass is as if the adjusting Adel module was only just open. If you received your new module I would love to hear your thoughts! Still waiting on it, but this sounds very promising! As I found adjusting the beta modules I had troublesome, a self-adjusting module would be just the ticket. Glad you liked the sound! Hi there. Just a quick question: Based on the comparison between the A12 and the 13FP, would you conclude that the A12 successfully dethroned the 13FP as the best phone out of all the already reviewed cream-of-the-crop CIEMs in your possession, at least based on your preferences? I’d be happy if the answer is a ‘yes'(even though I’m owing a pair of the JH13FP’s), because it seems like technology is continuously moving forward and CIEM manufacturers are constantly finding new ways of improving sound quality despite the big restraint that is called the small size of ear canals. Ah, exciting time we’re living in. Thank you in advance for taking your time reading my nonsense. Cheers! Because my A12 is a beta unit, the best I can do is “probably”. It really beat everything I threw at it in this way or that, and made it look easy, so I’d say it’s definitely very promising. I re-read your comparison with the JH13 FQ. Among your comparison phones in the review, the JH13 (pre-FQ) is the only one I own. I find it too warm, particularly with the mid-bass hump. Does the A12 have this mid-bass hump as well? No, the A12 (ADEL module open) has nicely linear bass, maybe slightly boosted but not with a hump like the JH13. That said, tonally it still has a slight warm tilt (as opposed to something like a Custom Art Harmony 8 Pro, which does not). How do you pit this A12 to the Hidition NT-6 Pro? Glad my somewhat rushed write-up was useful! Was having the hardest time choosing between the A10 & A12 as an upgrade to my V6-Stage. So much so I was considering backing both ($ouch$). In the end, after reading your review and especially your replies to the questions others left in the comments, I was quite comfortable with backing the A12. If someone else had done the review I doubt it would have been as helpful. The beauty of having you as the reviewer is the reference points I’ve gained from your lager body of work. Having listened to a good number (and bought several) of the headphones you’ve reviewed I feel like I’ve gained a good understanding of your preferences and how they align and differ from mine. Thus when reading one of your reviews I can rather confidently translate what you’ve described into what my impression of the subject would be. That’s pretty valuable (especially when considering a $1000+ investment)! That’s great to hear, and exactly the way I would like to see people using my reviews. Obviously we all have our own preferences, music, ears, and other biases, but with a wide enough coverage of the market I hope most people will find a couple of common data points to go off of. I’m sure you will enjoy the A12. Added an additional A:B comparison, against the UM Miracle, to the main review. JH Roxanne compared to the A12? Both are 12 driver CIEMs. Don’t have a JH Roxanne. “not sure if this has been asked before, but since the A10/12 are quad bores, does anyone know if there are size issues for those like me who have narrow ear canals? Not sure about the answer to this one in the case of 1964EARS. The only time I was told my canals would be too narrow or at least cutting it close is for the Spiral Ears 5-way (which is a 5-bore). So it is a real concern, but probably also up to the manufacturer in terms of how close they’re willing to work it. One might try for a quad-bore design with narrower canals while another may say “no go”. Thanks for the impressions. How does the quantity of bass compare between the v6s and the a12? And, about that midrange… How does the a12 compare to the tg334? That’s my personal midrange king! Mentioned in the review that the V6-Stage has more deep bass emphasis. A12 just has more mids and less of a v-shaped sig overall. Bass on still extends well and of course the quality is good, just lacks the deep bass boost of the V6-Stage. Taken by itself the midrange of the A12 is actually similar to that of the TG334, maybe a touch clearer and a hair less forward. The TG334 has great mids so no surprise there. However, the bass of the A12 is less emphasized and much cleaner, so unless you cut your TG334 bass with an EQ this carries over and makes the TG334 sound muddier and less open, which makes it less appealing in the midrange than the A12. Thanks Mikhail! I hear the TG334 the same way you do- muddier, less open, but with good midrange. A bit too warm for my taste. Also glad to hear that the A12 is not as bassy as the V6S. I got worried reading about the multiple bass drivers on the A12, but your review has convinced me that I needn’t have. Thanks- I did order the A12. Actually I pledged and unpledged up to 5 times 🙂 In the end, your comparisons really helped me decide to stay pledged. Thank you once again! BTW, will you be getting a U8 replacement for comparisons? I’ll send them back. Should be easy enough for 1964 to fix – I just don’t have a way of getting at the ADEL modules or I’d swap them myself. Might take a couple of weeks but I should have some U8 impressions. i saw you mention the heir 8.A in terms of warmth, what about the comparisons of sound sage and bass type/quantity. I have listened to the V6 Stage quite a bit and also have the 8.A, I do like the lushness of the 8.A and the sweetness as well and the THIUMPING it can do when called to… I am wondering how the A12 performs in these areas. Biggest difference signature-wise vs. the 8.A is probably the more upfront mids of the A12 vs the more bass-biased balance of the Hair. For lushness/thickness, the 8.A wins out but considering its clearer and less warm sound, the A12 is not as far behind as you might think. The 8.A bass digs a little deeper but as you know can stay out of the way quite well, which is also true of the A12. This is A12 with the modules partway open, as I’ve used it 99% of the time. What about the soundstage? is the A12 larger more realistic? notice anything in the instrument seperation/3d ness? The 8.A is pretty spacious already so it’s not a night and day difference but I would say the separation and overall airiness is better with the A12. The way I’m using them (with the module open partway) there vocals are not recessed at all. Maybe in the closed configuration, which brings up the bass somewhat, it can be said that there’s more of a “warm” tilt and the low end is a little more prominent than the vocals, but even then I think it’s a bit of a stretch to call the mids recessed. Thanks for your review on 1964Ears V6 stage vs A12? how about 1964 Ears V8? What is your comments comparing with A12? Thanks again. I’d love to heat your thoughts on A12 vs. U8, too. Seems the ADEL module for U8 is quite fragile.. Hope they will make it replaceable. Is a pity that U8 cannot be reviewed. There’s a few things about the beta modules that are less than ideal. From what I understand the final version will have hard stops at the end of the thread to prevent over-rotation. I didn’t love the last couple of Noble IEMs I’ve tried (6, PR, FR) – not as much as I like the 4S, at least – so I doubt I’ll get to try a K10. A V12 at a lower price would be interesting. Depends on how much lower, too, because I think for myself there would always be that lingering question of “what if I’d gone for the A12 just to have the other options?”. Ljoker, would you say that the A12 has the widest most spacious soundstage compared to all other. IEM/CIEM you’ve tried so far? And how do the A12 soundstage compares to full size open back headphones? I would say that if it’s not the best, it’s definitely very high up there. I don’t have a nice open-back dynamic universal on-hand at the moment to compare (something like a JVC FX850 or Senn IE80 or Yuin OK1, which is basically an open-air IEM) but on the whole it does beat out all of the BA customs and universals that I’ve thrown at it so far. A few like the Noble 4S don’t really sound congested next to the A12, but most do at least a little bit. Still need to try the UM Miracle, and maybe the Hidition NT 6 if I can find it. Full-size headphones are just different in the way they present soundstage but the A12 is getting there as much as any other IEM I’ve heard. So maybe somewhere between your average IEM and a proper full-size headphone? I guess it’s more like one of the more heavily damped “open” headphones (like the OPPO PM-1) than a true open-back design like the HD600. Little update on this – dug up the UM Miracle, Hidition NT 6, and a Sennheiser IE 800. None of them sound as open and spacious as the A12, especially not the bassier IE 800. NT 6 is closest, but ultimately lacks a little bit of the soundstage depth and layering. Can do full comparisons if anyone is interested but not sure it’s necessary with all of the ones already posted. Track-by-track reviews are just not my style. I prefer comparative/A:B testing as it leaves less room for interpretation. I sometimes need to go through 10, 20, 30 tracks going back and forth between two earphones before I can nail down my thoughts on a particular trait. Will add at least a UM Miracle comparison after I get all these questions answered. How does the A12 sound vs the Hidition NT6? Especially on the clarity front.. Clarity is similar between the two of them but the NT 6 derives some of its clarity from its brightness. It’s actually quite impressive that the A12 can keep up considering its warmer and more full-bodied sound. The NT 6 has a cooler tone and its treble sounds more splashy/not as smooth. The A12 is also a bit more spacious with better depth/layering. Similar to above, can you comment on where the ADEL was set during your review? From your comments about the aound being a bit boomier when fully sealed i take it you had it open a small amount? Thanks for the review, especially getting it here before the KS funding deadline! The impressions were done with the ADEL module open partway. One of the things that’s still being worked on is the ease of adjusting it – right now it’s a bit difficult to do – so I only tried an open state (knob rotated a bit from closed position) and the fully closed state (and again it’s not easy to switch between them quickly for A:B purposes at this point because each earpiece is adjusted independently, the knobs rotate in opposite directions (on the Beta modules), and you have to keep them balanced, etc). So, I don’t know if I was getting the full/optimal ADEL experience but the goal was to try it with the technology active, which I think I was able to do. Joker – Was your evaluation done with ADEL module closed or open? A lot of us KS backers are curious what the real world affect of opening the ADEL module is. Thanks! Discussed a little in another answer above. Can’t really A:B open with closed very easily because it takes a good amount of time to switch with the current implementation, but my feeling at this point is that (aside from slightly reducing the isolation) opening the module has the effect of reducing overall bass quantity but boosting bass quality, bringing the midrange more forward (which also leads to an increase in perceived loudness), and increasing treble crispness a bit. There’s also a net positive effect on presentation (depth/layering and openness), though the magnitude is a little hard to judge at this point.